After a super fun night in the WalMart parking lot (hardly!) and some errands in Grants, NM on Monday night, Nikko and I drove south on Rt. 117 about 12 miles to the El Malpais National Conservation Area/National Monument early Tuesday morning. 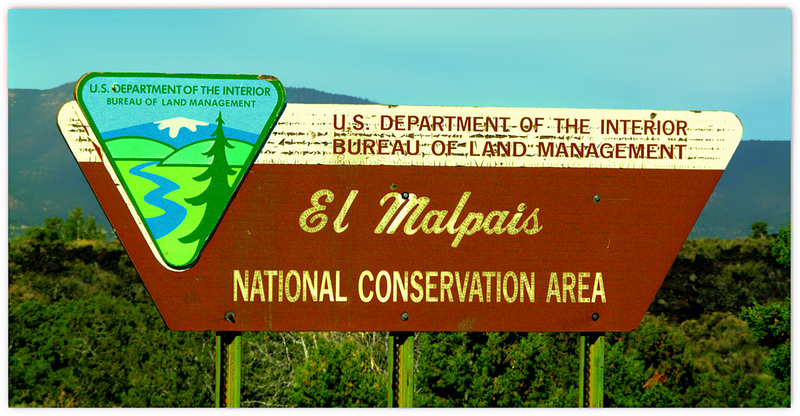 The El Malpais National Conservation Area (NCA) was established in 1987 and is managed by the Bureau of Land Management. The adjoining El Malpais National Monument was also established at the same time and is managed by the National Park Service. 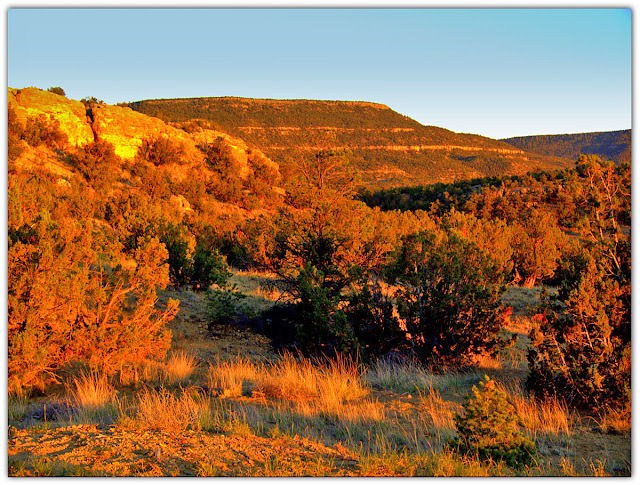 The 231,230 acre NCA includes two BLM-managed wilderness areas covering almost 100,000 acres. I stopped at the BLM Ranger Station to be sure of finding the campground and to get a little more info. It is a very well appointed station with a very informative agent. The Joe Skeens Campground was just 2 miles on down the road. 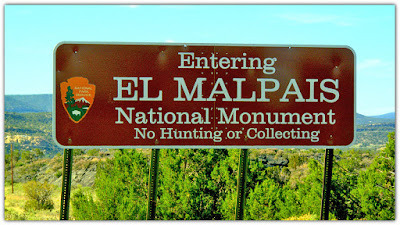 For more than 10,000 years people have interacted with the El Malpais landscape. Historic and prehistoric sites provide connections to past times. More than mere artifacts, these cultural resources are kept alive by the spiritual and physical presence of contemporary Indian groups, including the Puebloan peoples of Acoma, Laguna, Zuni, and the Ramah Navajo. These tribes continue their ancestral uses of El Malpais including gathering plant materials, paying respect, and renewing ties. Pulling into the campground, which has a free, 7 day stay limit, I immediately noticed it was more spread out than I thought it would be. A good thing! It encompasses a large loop, as so many do. Each site has a covered pavilion with a large picnic table on concrete, BBQ grill and a separate campfire grill. There are trash receptacles (you have no idea how great that is!) and two restrooms, but no potable water. I had plenty so that didn’t concern me. 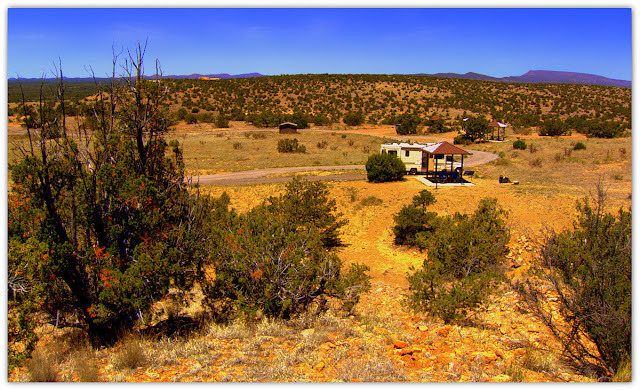 However, you can get up to 5 gallons of water (in containers) at the ranger station per day. The sites are well apart from each other except for two. They are set like that for group camping, I suppose. There is a full time camp host here who watches everything like a hawk! But, that’s his job….and he’s good at it. I circled around the loop once for a preview….out of the 10 sites, only two were taken. Sounds great on the surface, but many weren’t going to be great for an RV. 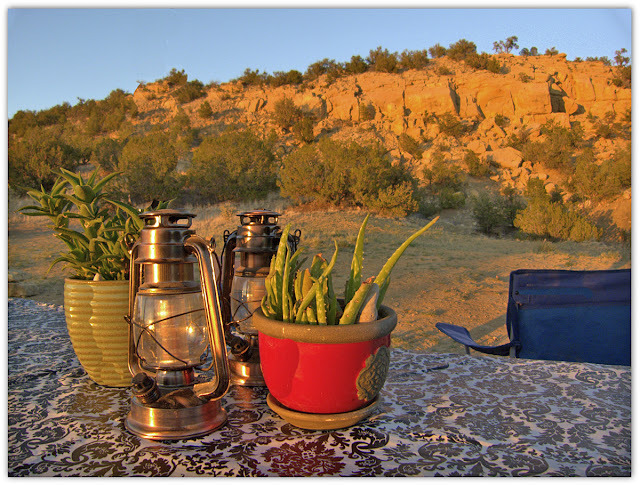 Like El Morro, most were for tent campers. But, I did find a good spot (the highest spot on the loop, which I like) at the north end of the loop (towards the nearest cell tower!). It wasn’t totally level from side to side, so I made do with some rocks! Still a little off, but not bad. I could really use a couple of sets of Lynx Levelers…they are like Legos and don’t take up much storage space. 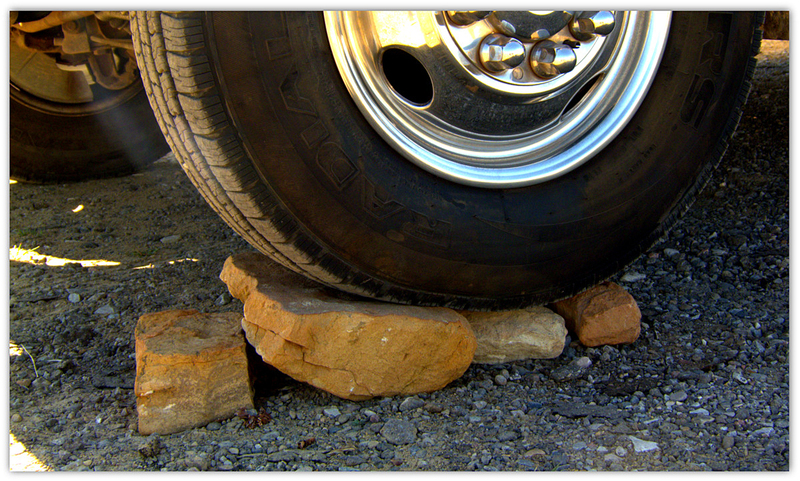 There aren’t always flat rocks around! 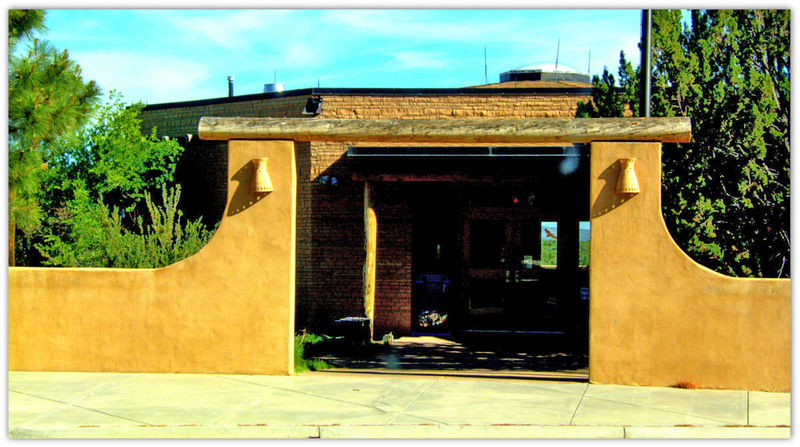 My side door opens up to the pavilion with a big rock ridge behind it. Nice setting! 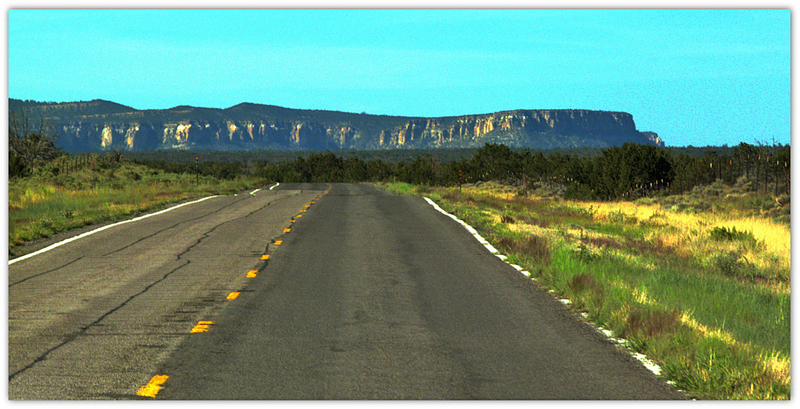 In the distance in other directions are mountain/mesa ranges. 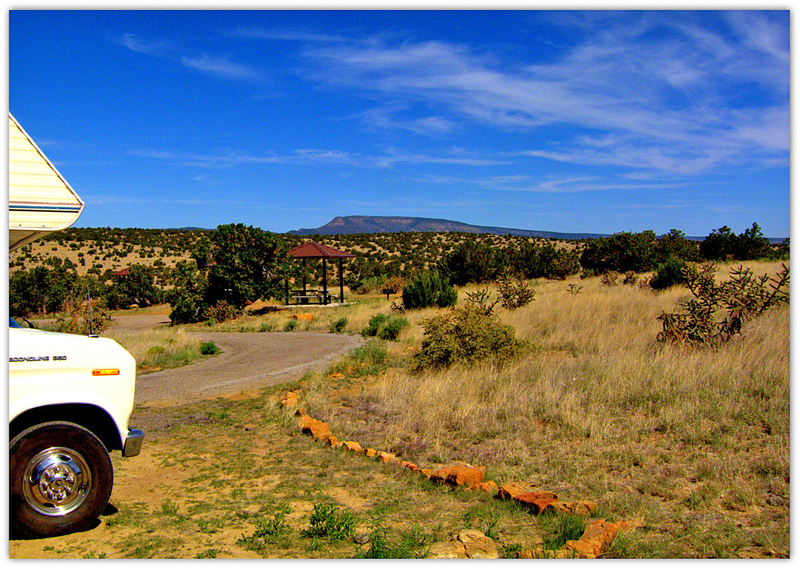 Just 30 yards from me is a wire fence which delineates the campground/El Malpais from the Acoma Reservation. The loop is a good walk for Nikko. The rules say dogs must be on a leash plus there are cactus (and snakes are plentiful now) in the tall grasses all around the campground. We encountered the cactus once, but as usual, he was patient while I pulled out the quills. It was a good thing I got here early in the morning because later that day every space was filled. 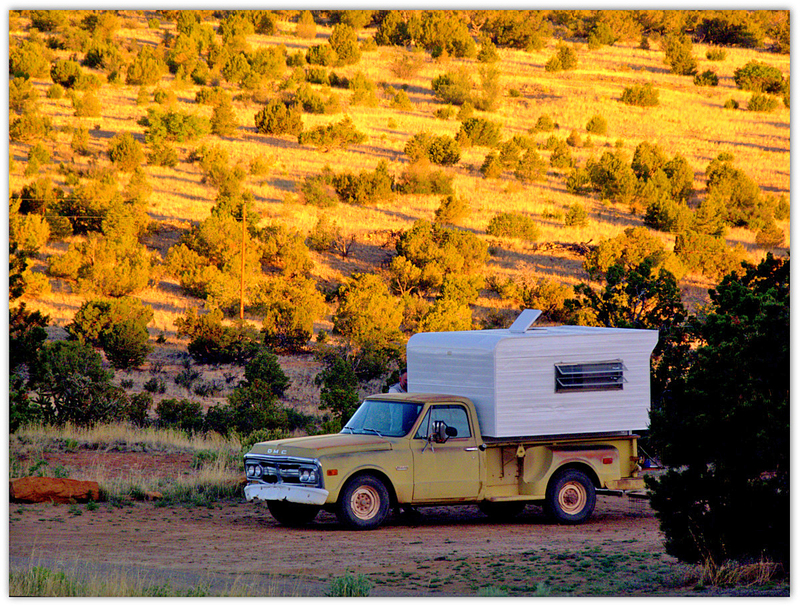 The couple from Sun City, AZ that I met in Winslow, AZ came by late in the day (knowing I was here)….too late….no space for their travel trailer. They moved on to “somewhere”….I haven’t heard from them again. There isn’t a lot of “excitement” to report from this spot. It’s a quiet campground. I know there are many trails outside the campground off Rt. 117, but without a car, it is cumbersome to get to them. That’s okay. It’s a very nice place to stay…free…for a week! One camper here is a former Park Ranger/Law Enforcement Ranger. He retired and now just travels around in his very simple camper doing odd jobs. He loves his life! You never know who you will meet...another aspect of RVing that makes life interesting! There’s a nice, younger couple about 4 sites down the hill from me, Pia and Lee from Dallas, TX, who just started full time RVing about a month ago. They travel with two mini-greyhounds and a 16 yr old “Benji-type” dog. Pia is a glass artist and glass blower, originally from Finland. 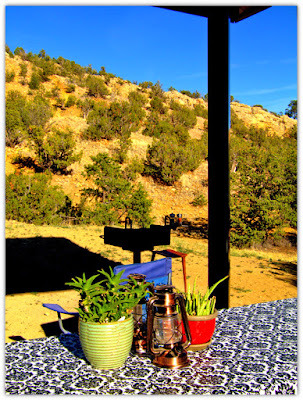 We had a nice lunch together at their place one day talking about the ins and outs of RVing. One evening I tried to get some photos of a herd of elk at a watering hole out on Rt 117, but it was almost dark. This was the best I could do after Photoshop helped out with lightening them up a little. You can see their eyes glowing! 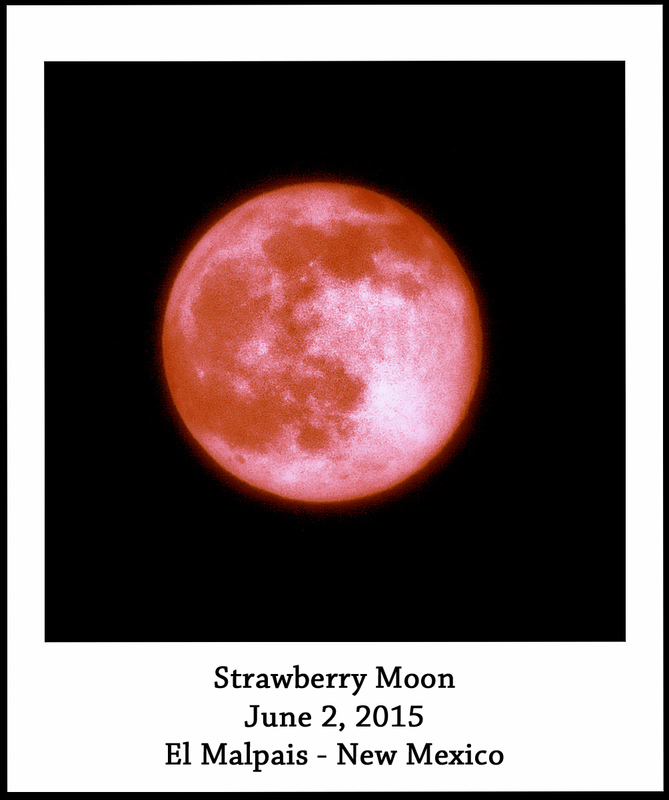 June 2nd was the full moon – the Strawberry Moon. Apparently in some locations it did have a reddish hue to it. I waited and waited for it to come up from behind the rock ridge at my site. It finally did, but no strawberry color here at El Malpais. Too bad. So, I just made my own Strawberry Moon from a shot I took...just for the memory of what "wasn't"! 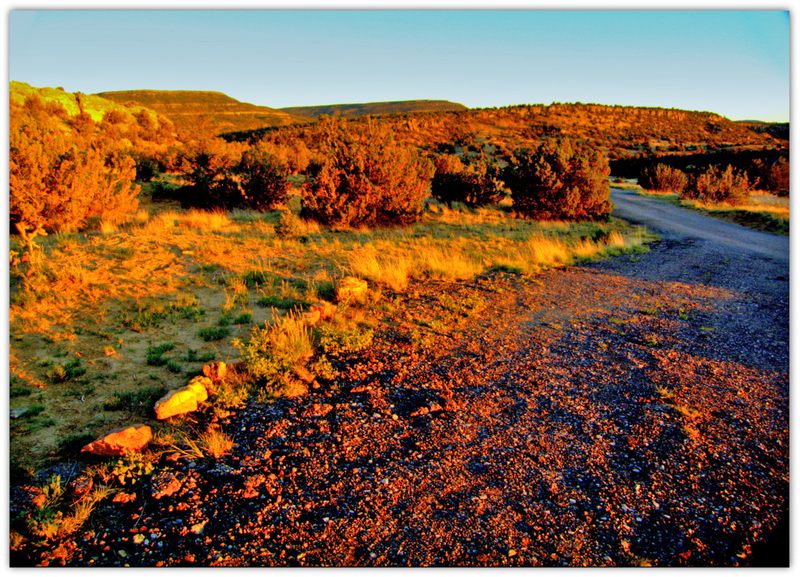 When I leave here I will drive further south on 117 a few miles to take some scenery shots. I know from taking a quick drive down there with another camper, Jack, (who is actually a “local”) it will be worth the extra few minutes and miles before heading back up to Grants to pick up some mail and water before heading on to the next spot. I couldn’t ask him to keep pulling over for my photo-taking-benefit. Hopefully the early morning light will be good that day. 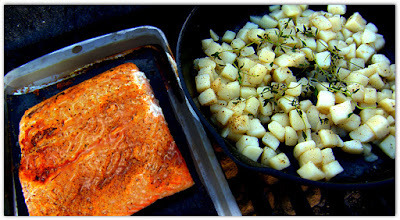 I will share those photos in my next post. I am able to post this from the campsite this time (vs. McDonald's or other free wifi spot) because, for once, Verizon made an error in MY favor! I called complaining about an issue and somehow, they gave me a $140 credit plus an extra 1G for $20 less/month, plus they started the now 15Gs over at zero used starting yesterday which is good until the 16th. That’s not the way it was supposed to play out at all, but I’m not saying anything! Of course, it will only be worth it IF, in fact, these “plusses” are actually reflected on my next invoice properly! I’ll leave you with some good dinners and sunsets. 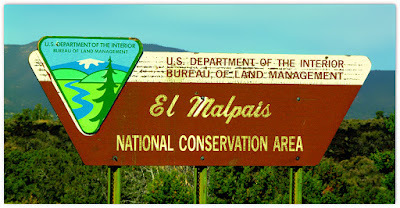 Will post the scenic El Malpais photos as soon as I can. Stay tuned! I think you will like them! 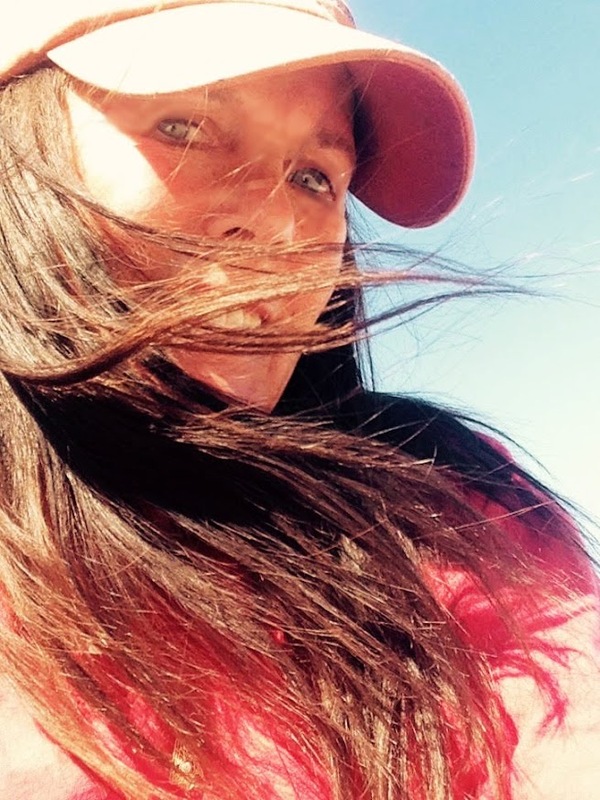 Thank you for placing your Amazon orders via the link(s) on this blog. It really helps me to be able to continue the publication! Good site! Nice elk at watering hole. They probably go there regularly! People seem nice, too! Glad you got a break from Verizon this time.